Easy going no fuss guy love meeting people and enjoy the craic. Love music, sport and d.I y. Good hearted, funny, good personality. Not fussy. Meet at a bar have few drinks, have a nice meal in restaurant. 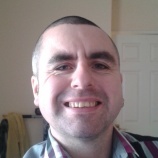 Topguy77 is a Male dating in Tyrone, Ireland. Check the description of this 41 years old profile, he is White/Caucasian and Catholic maybe this matches your profile description and you can both start dating in Ireland for free. The stars says he is a Virgo maybe you should check your horoscope and match up your star sign.